This time of year, in our neck of the woods, zucchini are everywhere! They grow so fast and furious when the heat comes on and boy have we had the heat. We have been eating zucchini since May. 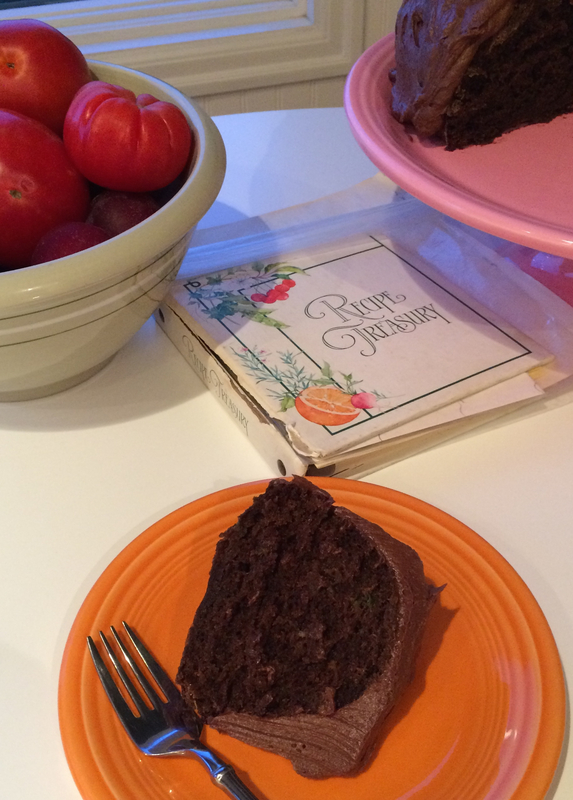 I have been thinking about making chocolate zucchini cake for a couple weeks now. My mom used to make it for us every summer, and always from one of those huge zucchini that one day was too small to harvest and then somehow the next day, it seemed, the thing was as big as a small animal. One of those big guys will go a long way. This past week at the farm, we received EIGHT zucchini. Three of them were large. I have gone through the rest, but I kept back one that was big enough for this cake. Once Sammy found out what I was planning to use the last big zucchini for, he has been gently reminding me, every day, to MAKE THAT CAKE, already! I dug out my old school recipe book that is now in tatters, and opened it to my mother’s recipe, beautifully written in her own hand. I have been lugging this little recipe book around with me since I was a teen (many, many moons ago). 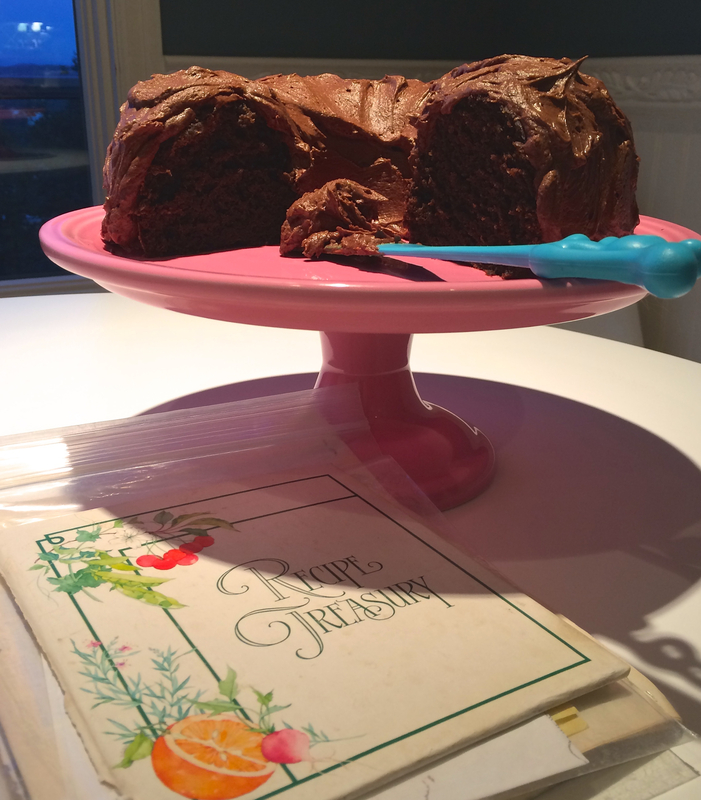 Mom used to make the cake in a rectangular glass baking dish. I have grown quite fond of bundt pans. 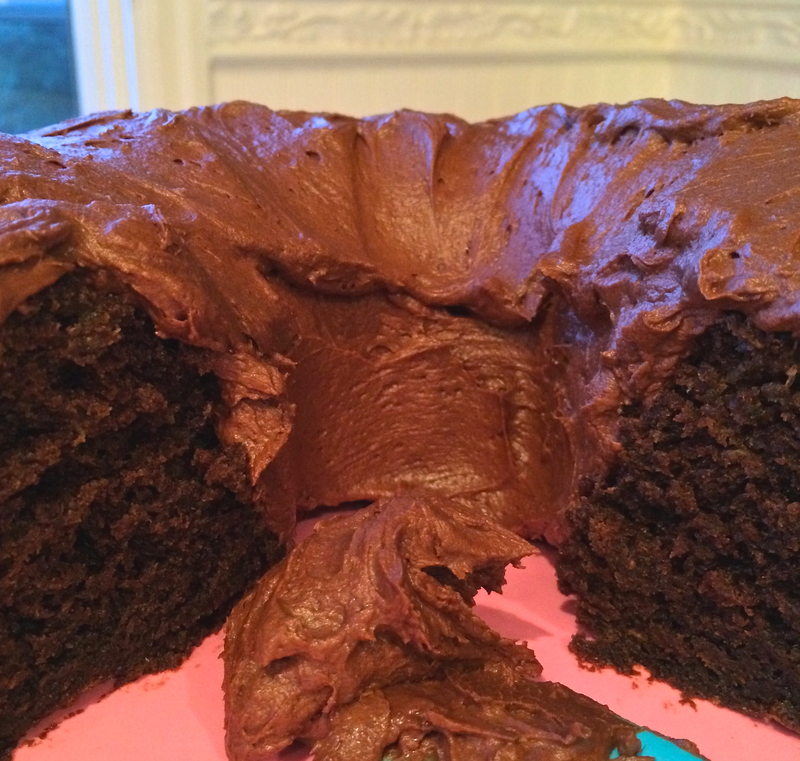 *I also add in 1/2 cup of sour cream because I like how moist my cakes are when I use the sour cream. It is not in Mom’s original recipe. Next add in some powder sugar and then milk, then some powder sugar then milk. Repeat until all is well mixed. Mix on low speed. After frosting is well blended, add in vanilla. Makes about 2 cups of frosting. Sammy and his buddies decided they could not wait until the cake was frosted… they wanted a warm slice and they deemed it delicious but better if I could get to frosting the thing, soon. That is why, in the pictures, there is a big chunk missing. I frosted a partially eaten cake. It wasn’t the first time, and it won’t be the last. Oh yes, veggies moisten things right up… like carrot cake 🙂 . Good luck with the carb reduction, I am doing the same. I feel so much less sluggish and bloated when I cut the carbs. Looks delicious…will definitely try the recipe once my neighbor starts sharing her zucchini harvest! I think you should be mailing these out to us…..
Mmmmm … How I wish I had that for my breakfast, I can just feel the chocolatey goodness 😃 it’s gorgeous! Reblogged this on Just read.